Chelsea and Westminster Hospital NHS Foundation Trust piloted ThinkShieldвЂ™s ThinkVitals product within the Acute Assessment Unit in 2014. 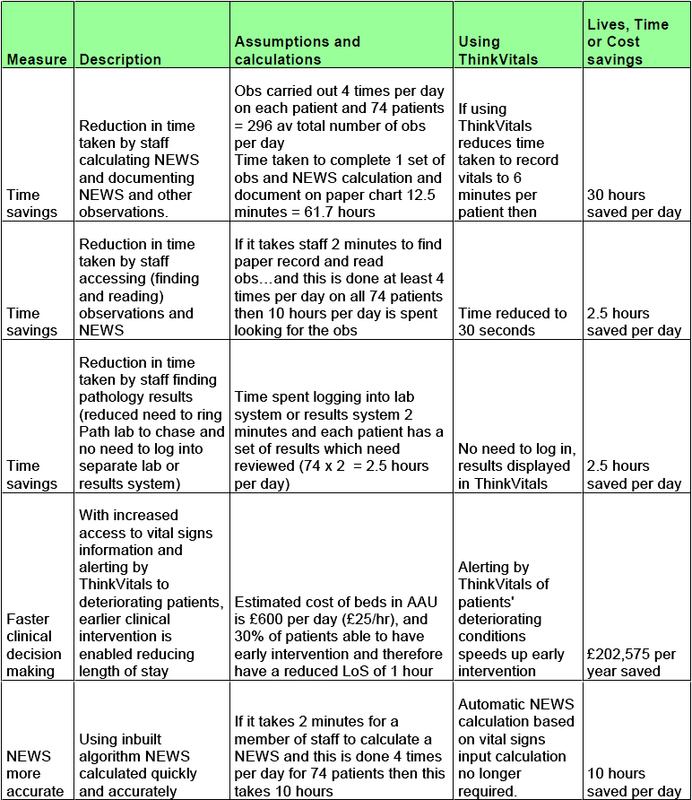 This proof of concept showed the effectiveness of ThinkVitals to increase patient safety through the digital capture of vital signs and the use of decision support for identification and management of sepsis. Providing clinicians with access to patientsвЂ™ real time observations enables clinical decisions to be made more rapidly and acuity levels to be managed more effectively. It enables the reassignment of staff to deteriorating patients. At Chelsea and Westminster Hospital the National Early Warning Scores (NEWS) used to manage patient care were in some cases not being applied well. Staff were having difficulties with calculating correct scores and not identifying quickly those patients with deteriorating scores leading to an increase in risk for patients. 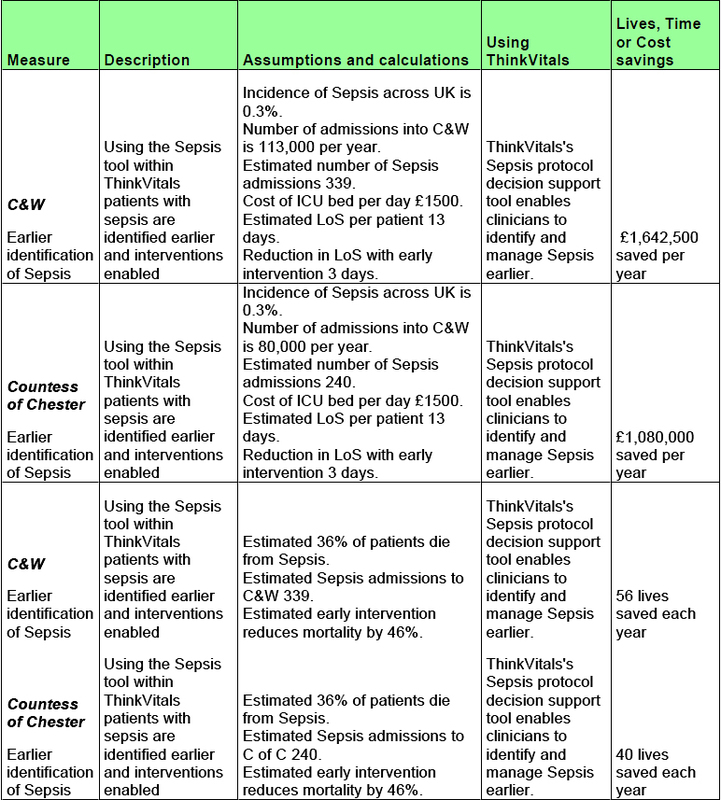 The trust had also identified the early detection of Sepsis in patients as an area for improvement. Sepsis is a time-critical medical emergency, which can occur as part of the bodyвЂ™s response to infection. The resulting inflammatory response adversely affects tissues and organs. Unless treated quickly, sepsis can progress to severe sepsis, multi-organ failure, septic shock and ultimately death. Septic shock has a 50% mortality rate with over 35,000 people dying from this condition every year in England. One of the keys to ensuring appropriate clinical responses to increasing acuity is to alert staff to deteriorating vital signs as early as possible so that the staff can intervene promptly. Early detection of deteriorating patients followed by appropriate clinical response greatly reduces morbidity and patient care costs. Action was needed.! ThinkVitals was identified as the system of choice to improve early detection and response to NEWS changes and the early detection of sepsis. ThinkVitals has been developed in association with the clinical staff at ChelWest and provides features and functionality, which easily delivers the improvements required. The user-friendly screens are simple to use and allow the busy clinician clear views of a patientвЂ™s vital signs and NEWS. A bed management screen mirroring the actual ward or location clearly shows wards and their associated beds. Each of the occupied bed icons displays vital information about that patient. It displays their first name and surname, and very clearly highlights the NEWS for that patient with the bed icon colour-coded depending on the score and an indication of whether the patientвЂ™s observations are overdue. A drill down function results in all of a patientвЂ™s demographic details and their vital signs being displayed. The at-a-glance ward view of patients and their clinical statuses enables the clinical staff to see who is needed where; enabling better staffing management. ThinkVitals New Observations screen allows the user to capture a patientвЂ™s vital signs and clinical observations with the minimum of effort with the easy to use slider function or with one click of the mouse. The inbuilt algorithm uses the patientвЂ™s observations to automatically calculate the NEWS and update the display. ThinkVitals displays a patientвЂ™s clinical observations of temperature, heart rate, respirations, BP (standing or lying), SATS, last NEWS, Blood Glucose (pulled in from the lab system), weight and height (pulled in from LastWord or manually entered when not available at admission), pain score, urine output, fluid balance, BiPAP, and any supplemental oxygen, and patient results (Labs) information in charts and reports and all in real time. ThinkVitals includes a countdown timer and an alert system to remind staff to take new observations and readings. All of the functionality is aimed at alerting staff to patients whose condition requires immediate or intensive attention. standard criteria for SIRS and supplemental questions on infection) the user quickly identifies if the patient has sepsis, and what action to take if they have, including a specially developed algorithm for the prescribing of Gentamicin. This protocol advice is set to the clinical standards of the individual organisation and is highly configurable with much of the information being pulled from sources integrated with the application to reduce the need for manual entry and therefore potential errors. 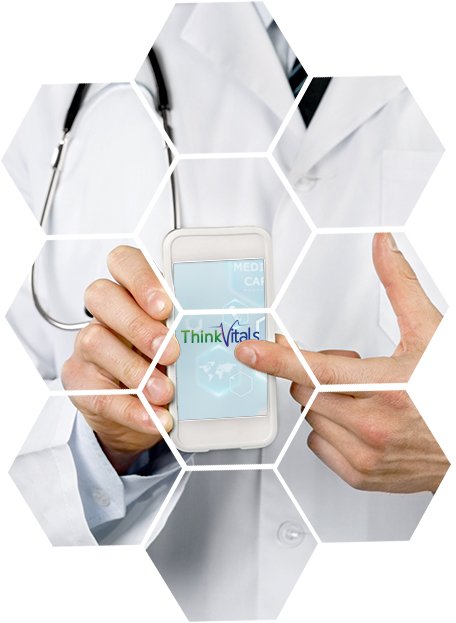 ThinkVitals uses standard APIs based on HL7 messaging. Chelsea and Westminster Hospital NHS Foundation Trust is a 475 bedded acute inner London hospital. It has 3000 staff, 70,000 admissions per year, and 113,000 A&E presentations. The Acute Assessment Unit was set up in 2010 as a response to increasing pressures on A&E services. It treats on average 74 patients per day, and has a dedicated team of medical, surgical, nursing and therapist staff. The unit is a joint Medical Assessment Unit, Surgical Assessment Unit and Coronary Care Unit. It has both trolleys (10) and beds (44). It is staffed by a surgical team and medical team doing 4 month rotations, with 6 consultants, 4 registrars, 9 SHOs and 6 HOs, a nursing team of 61, highly skilled with additional training to support the unitвЂ™s work, a small pharmacy team of 1 pharmacist and 1 pharmacy technician and a small team of therapists (physiotherapists and occupational therapists with additional training) shared with the rest of the trust. It is open 24hrs a day, 7 days per week. Patients are initially assessed in the unit and a decision made on their estimated LOS. Patients with an expected LOS of less than 48 hours remain on the unit and greater than 48 hours are admitted to an appropriate ward in the hospital. Patients present to the unit from A&E or direct from GPs. GPs go through a telephone triage prior to the patient presenting to the unit. AAU was chosen for the pilot because it was considered better at managing deteriorating patients and staff on the unit were very enthusiastic about improving the service and using technology to do this. Running the pilot would require staff to capture the vital signs data twice (double data entry) until the pilotвЂ™s completion but this was considered acceptable to the staff. The wider intention is to roll out ThinkVitals across the entire trust. AAU has also been assessing the use of various devices for the usability (size of screen display and size of device) of the product. So far the iPad or android device of same size seem to be the best in terms of portability of device and screen display. ThinkVitals at C&W pulls in information on patient location (ADT information) from the existing GE HealthcareвЂ™s Lastword system and automatically displays all of that information within the ThinkVitals bed management screen and therefore within a patient-bed context. It also pulls lab result information from ChelWests lab systems and displays that in a separate screen in the application accessible from the banner bar. The scope of the pilot covered the use of the product on the AAU only. The staff using ThinkVitals included all medical and surgical teams assigned to the AAU, the nursing team, the therapists and pharmacy staff. Access by users was governed through the use of role based access control using the hospitals Active Directory which was defined through discussion with Chelsea and Westminster. This approach fits with most NHS organisations as the intention for the application has been to make it as generic as possible for the wider NHS audience. Patient information is not stored on any of the user devices so in the unlikely situation of the device being lost or stolen there is no risk to patient confidentiality. Patient data is stored securely on a trust hosted server. In the ChelWest pilot, the data has not been available or used by anyone (companies or individuals) outside Chelsea and Westminster Hospital Foundation NHS Trust. Access to the patient information was restricted to registered clinicians and teams on the Acute Assessment Unit, in Chelsea and Westminster Hospital Foundation NHS Trust. Formal evaluation is currently underway. There has been very positive feedback from the staff using the application with nursing staff reporting that they can now see at a glance where on the ward specific staff are required to manage the acuity. Early identification of acuity on the AAU is now a reality for the staff. The plan is for ThinkVitals to be rolled out to the entire trust. Additional modules currently in development of Maternity, ED and Paediatrics will also be rolled out to the entire trust. The tables below provide some metrics based on some assumptions about numbers of patients, length of time taken to complete certain actions and costs associated with carrying out those actions at Chelsea and Westminster. There are other benefits from using ThinkVitals around quality of care and patient risk and these will be the subject matter of a separate paper. All of the metrics in the table below equally apply to any trust carrying out NEWS and Sepsis management. The metrics for Sepsis are obviously dependent on the number of patients admitted to assessment units or ICUs. The calculations in the table below represent both Chelsea and Westminster and the Countess of Chester respectively. The information in this document is confidential and may not be, reproduced, enhanced or otherwise changed without the permission of ThinkShield Ltd. This document may not be shared or distributed with any person or organisation other than for whom it is destined or addressed. Copyright ThinkShield Ltd.